OK, some people won’t believe the title to this blog post, but it is true! In my most recent column in the Wisconsin Law Journal, I talk about the recent ABA FLS meeting in Anchorage, Alaska. In addition to seeing old friends, I always make new friends and this year, one was a lovely English solicitor who spoke at the seminar on international surrogacy laws. Her fiance, Joe, was a great guy as well. Maybe I have strange tastes, but some of my best friends are divorce lawyers. Most (unfortunately not all) went into the field because they want to help people. Most (unfortunately not all) try very hard to settle very difficult, emotionally laden cases. 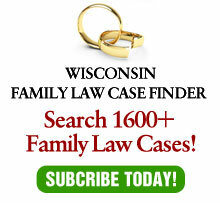 As a result, most conferences of family law attorneys are meetings of caring people. So it’s easy to make friends, which become the most important part of these conferences. It doesn’t hurt that these conference are usually in nice places. The next one, for example will be in Deer Park, Utah. I have no idea where that is, but it is impossible for a place with a name like “Deer Park” to be anything but real nice. Then, the spring, 2014 meeting will be in Bermuda. Yeah, that sounds nice, too! The combination of nice places and good people is hard to beat!